Degas was, of course, one of the core members of the Impressionist inner circle, although he is now seen as remaining the odd man out. 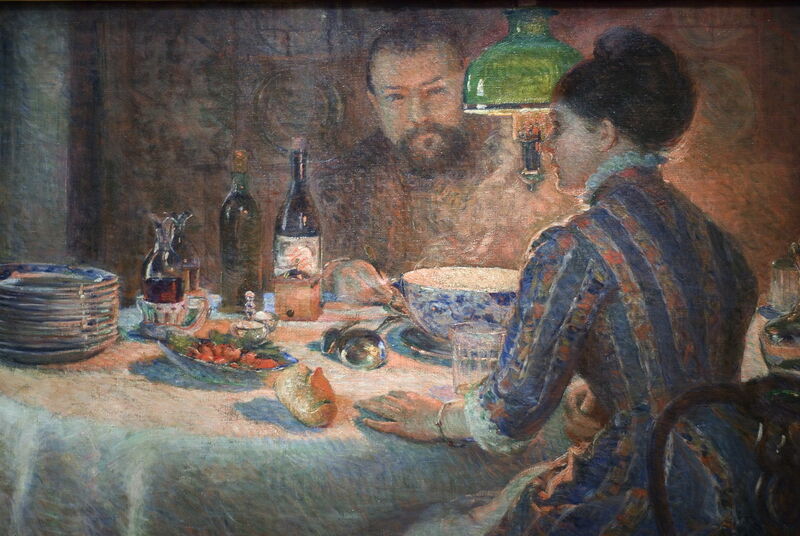 In addition to meeting and debating with the other Impressionists in various cafés and bars in Paris, Degas had special relationships with Camille Pissarro (1830–1903) with whom he shared enthusiasm for and techniques of print-making, and Pierre-Auguste Renoir (1841–1919) who remained Degas’ most loyal and steadfast friend even into Degas’ cantankerous old age. As one of the senior Impressionists, and organiser of many of their exhibitions, younger artists who moved on from Impressionism also enjoyed his friendship, and were influenced by him – even more radical artists such as Paul Gauguin (1848–1903), who was another painter to experiment with Degas’ technique of peinture à l’essence (below). 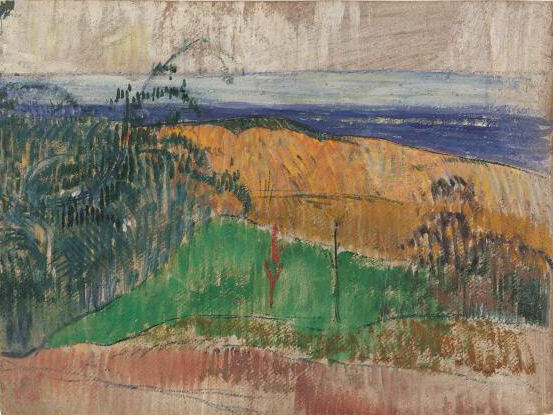 Paul Gauguin (1848–1903), Vue de la Plage de Bellangenay (View Of The Beach At Bellangenay) (1889), oil with turpentine on cardboard, 31.3 × 43.2 cm, Private collection. Wikimedia Commons. 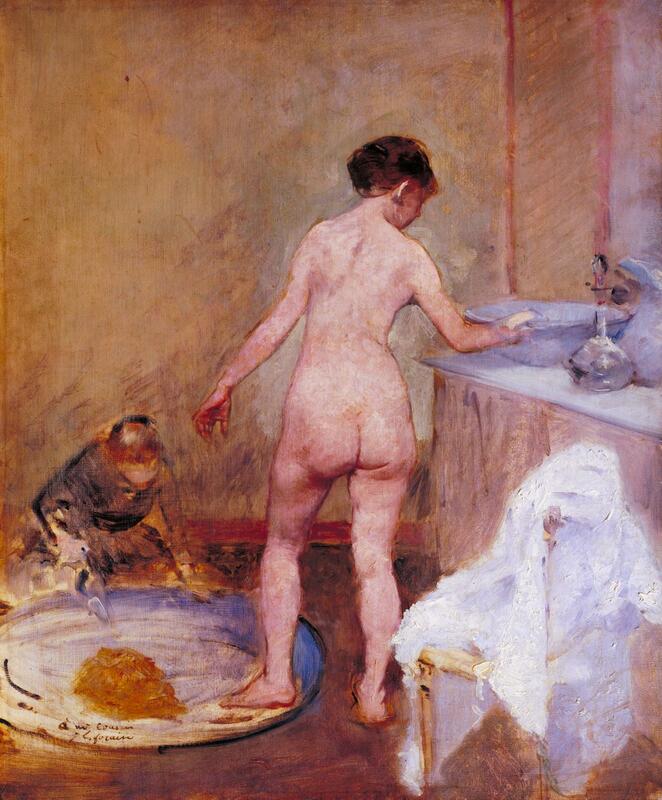 Degas was mentor to all three of the major women Impressionists. He seems to have become friends with the Bracquemonds soon after Marie Quivoron (1841–1916) married Félix Bracquemond in 1869, but Marie’s new husband disliked her choice of mentors (Monet and Degas) and repeatedly attacked her Impressionist painting. Marie Bracquemond exhibited in the fourth Impressionist Exhibition of 1878, and the fifth in 1880, but finally abandoned painting after about 1890 as a result of her husband’s sustained attacks on her work. Berthe Morisot (1841–1895) probably became friends at about the same time, and Degas helped her technically and was strongly supportive of her art. Degas first met Mary Cassatt (1844–1926) rather later, after she had already become an admirer of his pastel paintings in about 1875. When both her entries for the 1877 Salon were rejected, Degas encouraged her to exhibit with the Impressionists at the fourth exhibition, which was delayed until 1878. Degas provided Cassatt with extensive help when she was learning print-making, and they remained friends despite their often opposite views, until both were suffering the effects of age in the early twentieth century. It was Degas who introduced Gustave Caillebotte (1848-1894) to the Impressionists in 1874. When Caillebotte’s Floor Scrapers was rejected by the Salon in 1875, Degas brought him into the second Impressionist exhibition of 1876. The two remained good friends until the mid 1880s, when Caillebotte switched to landscape painting and moved out of Paris. 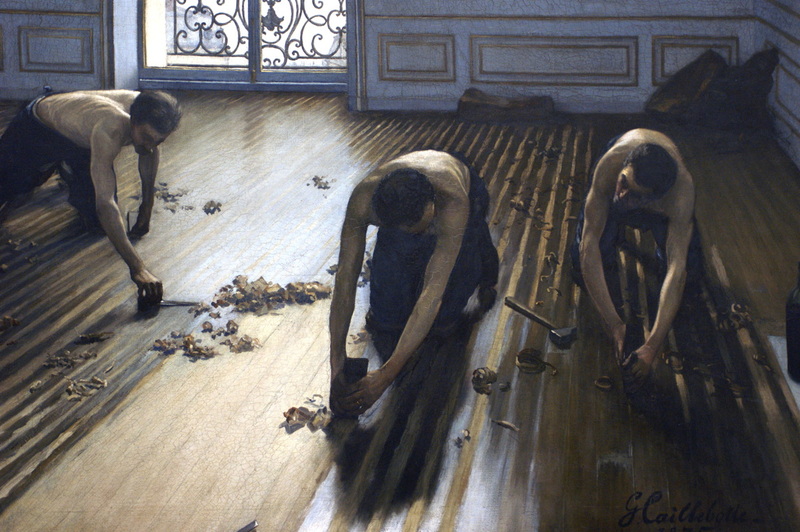 Gustave Caillebotte, The Floor Scrapers (Parquet Planers) (1875), oil on canvas, 102 x 146.5 cm, Musée d’Orsay, Paris. WikiArt. Degas’ most troubling friendship was with Jean-François Raffaëlli (1850-1924), who joined Degas’ circle in the late 1870s. Degas helped his career and repeatedly tried to bring him into the Impressionist movement and its exhibitions. Raffaëlli threatened to overwhelm the work of the ‘real’ Impressionists at their exhibition in 1880, when he showed thirty-seven works, and forced Monet to withdraw altogether in response. This was all the more galling for the likes of Monet as Raffaëlli’s paintings were some of the few works to attract widespread critical approval. Although Degas did not take pupils, he acted as mentor to several artists, including Marie Bracquemond, Berthe Morisot, Mary Cassatt, and Jean-Louis Forain (1852–1931). 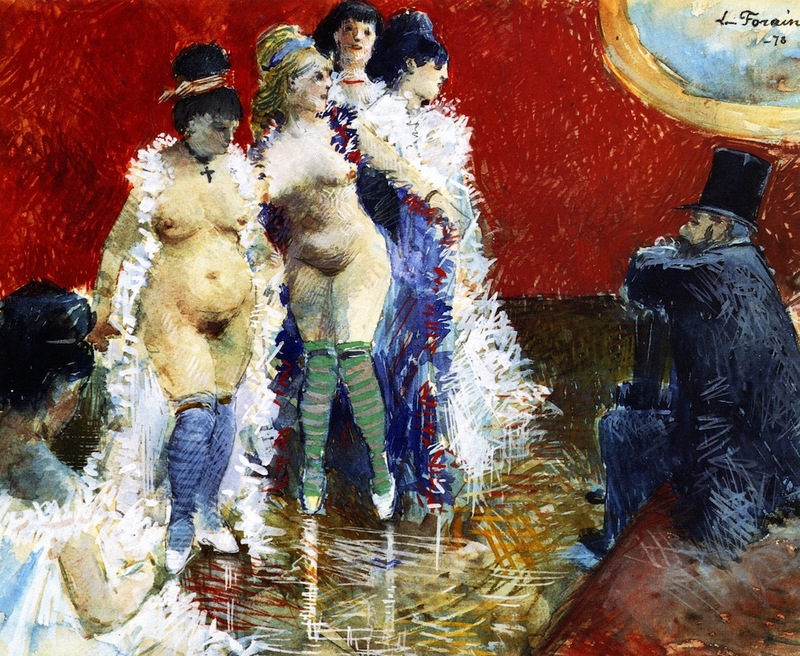 Forain first exhibited at the fourth Impressionist Exhibition in 1879, and painted similar motifs to those of Degas at the time – dancers, horse racing, and women washing themselves – but in very different style. After about 1900, Forain moved on to social realism in law courts and everyday life, in a similar vein to his other muse, Honoré Daumier (1808-79). Jean-Louis Forain (1852–1931), The Client (1878), watercolour, gouache and pencil, 24.8 x 32.4 cm, Dixon Gallery and Gardens, Memphis, TN. The Athenaeum. 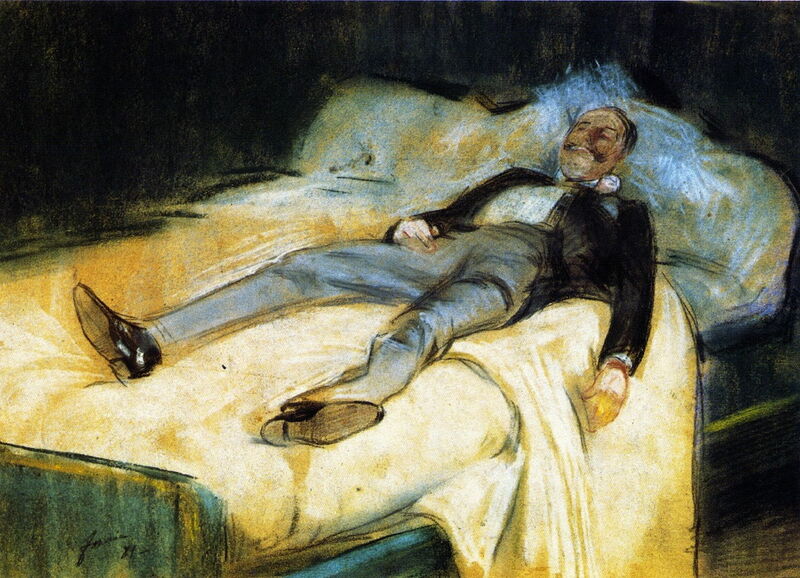 Jean-Louis Forain (1852–1931), After the Ball, or The Reveller (1881), pastel on paper, 31.1 x 47 cm, Dixon Gallery and Gardens, Memphis, TN. The Athenaeum. At about the same time that Forain was preparing for the 1879 Impressionist Exhibition, Diego Martelli (1839-1896) arrived in Paris, another member of the Macchiaioli who was welcomed by the friendship of Degas, Manet, and Pissarro. In 1883, Walter Sickert travelled from England to Paris, where he met Degas and was to remain influenced by his work. After that, Paul César Helleu (1859–1927), a close friend of John Singer Sargent, made friends with Degas, who persuaded him to exhibit at the eighth Impressionist Exhibition in 1886. Finally, although I have no details of their having met, let alone become friends, Henri de Toulouse-Lautrec (1864-1901) was a contemporary who was greatly influenced by Degas’ work, and combined peinture à l’essence with pastels (below). 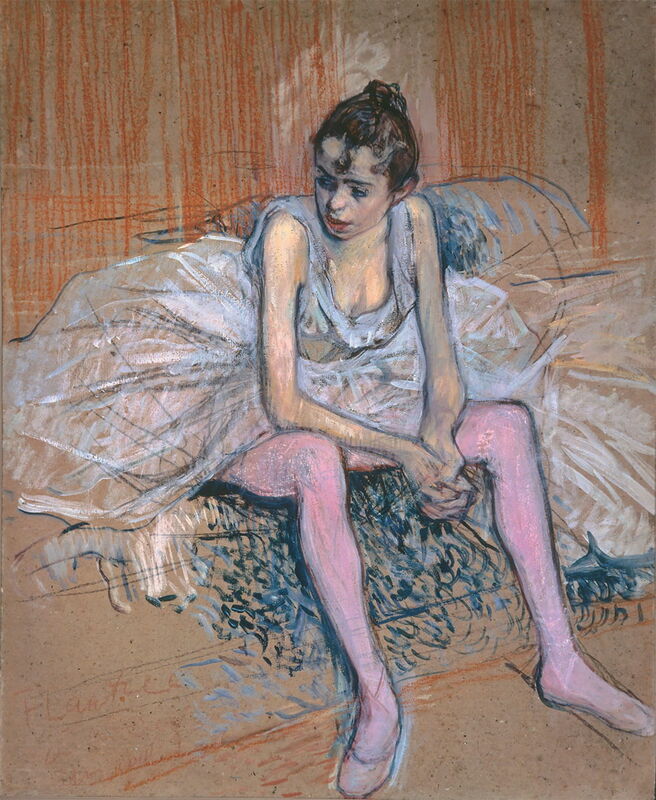 Henri de Toulouse-Lautrec (1864-1901), Danseuse assise aux Bas de roses (Dancer sat at the foot of Roses) (1890), peinture à l’essence and pastel on board, 56.8 x 46.4 cm, Private collection. Wikimedia Commons. Posted in General, Painting and tagged Bracquemond, Caillebotte, Degas, Forain, Gauguin, Macchiaioli, Martelli, Morisot, painting, Pissarro, Raffaëlli, Renoir, Sickert, Toulouse-Lautrec. Bookmark the permalink.